Enjoy the ultimate romantic vacation in Puerto Vallarta and Punta Mita with 9 days that include stays at a boutique hotel, an award-winning resort, and a secluded luxury hotel. Spend your days indulging in chocolate covered strawberries, candlelight dinner perched on cliffsides, romantic hidden coves, and relaxation at the beach. Arrive Puerto Vallarta 2 Nights > Drive Nuevo Vallarta 2 Nights > Drive Punta Mita 4 Nights > Drive Puerto Vallarta & Leave. Upon arrival in Puerto Vallarta Airport and privately transferred to your boutique hotel, Hacienda San Angel, where you will settle in to your Master Suite. Overnight stay at the Hotel Hacienda San Angel. After breakfast and hotel check out meet your transfer to Grand Velas Riviera Nayarit for a romantic massage with the one you love. Enjoy a glass of sparkling wine and chocolate covered strawberries to complete your romantic evening. At night dinner at a AAA 4 Diamond restaurant. Overnight stay at Hotel Grand Velas Riviera Nayarit . Today enjoy a dolphin swimming experience like no other. This program was created just for couples looking for an intimate and tailored dolphin encounter. In your own private area of the pool, with your own dolphin and dedicated dolphin trainer, you will have the time of your life! Enjoy rest of evening at leisure. 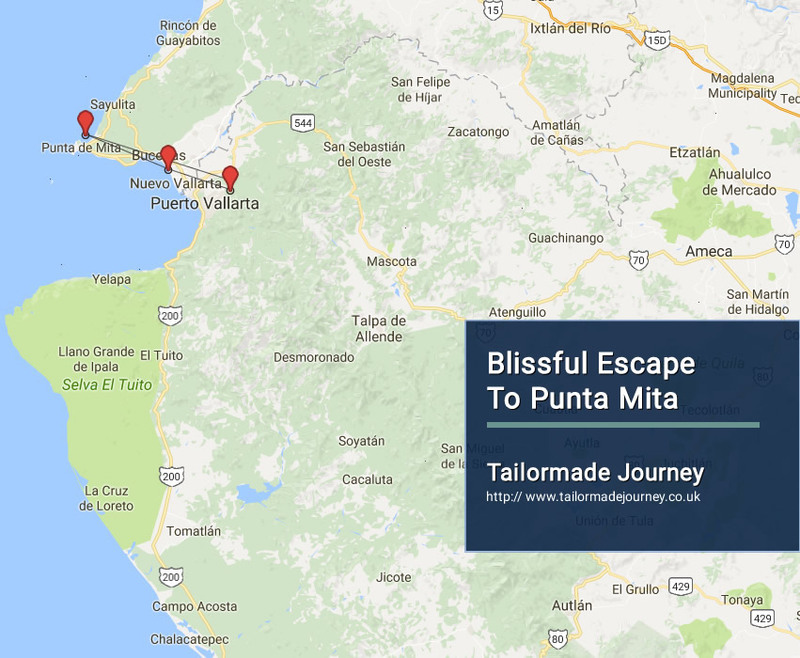 Depart Nuevo Vallarta for a 45 minutes ground service that will take you to Imanta, where you will settle into your luxury ocean casita. Be received by a traditional “Nayarita” snail blower and an “ancient-drum” player that will guide you to a hidden location with panoramic views of the Pacific Ocean and the jungles of Sierra de Vallejo. Enjoy a Relais & Châteaux culinary experience with the most discreet and intuitive service at hand. Overnight stay at Hotel Imanta . Today is yours to enjoy at leisure the pristine white-sand beaches and the beautiful property. Or optional activities may be arranges such as snorkeling, golf, surf or fish to your heart’s content under the Mexican Riviera sun. At night, Imanta is a relaxing retreat and the whole resort is meant to be your spa. This evening enjoy a couples massage in the comfort of your suite or in one of the jungle, beach or observatorio locations. Today enjoy a Romantic Hour at Hidden Cove . Today you will paddle your way on a kayak from our beach to enter into a cove like no other, where sunrays reflected in the turquoise water below you illuminate the rock ceiling as in a Mayan Cenote and where a pristine sand little beach awaits you. You will find a resting area and we welcomed with an aphrodisiac treat and a small bottle of champagne. You may also explore the surroundings with snorkel equipment. (this activity is subject to water conditions). This afternoon back to Imanta enjoy a Temazcal Bath to experience the ancient “Mexica” tradition of a Temazcal Bath where the “Temazcal Lady” and two hot-stone carrier assistants greet you at the site and offer herbal tea or water to hydrate your body before staring the ceremony. The site, already prepared with a fire pit that heats volcanic stones that will be used in the bath. Clay containers with aromatic and healing herbs in water are poured on the red hot volcanic stones creating a hot steam that will detox and rejuvenate your body, allowing bathers to be re-born into the world from the womb of Mother Earth. The perfect way to end a Blissful Escape to Punta Mita!